After the Civil War, a class of industrialists and financiers amassed great fortunes while building the infrastructure of an expanding nation. Much of this money and power was concentrated in New York City, which quickly became crowded and unsuitable for the building of large estates. Many wealthy businessmen began to look eagerly toward the pastoral beauty of New Jersey as a site for their luxurious homes. Modeling itself on the English aristocracy, this uniquely American plutocracy sought to establish country seats, requiring acreage on a grand scale but in close proximity to New York City. Men such as George Seney, president of the Metropolitan Bank of New York, began purchasing property in Somerset County in the early 1870s, and soon many others were purchasing land in the county from the local farmers. 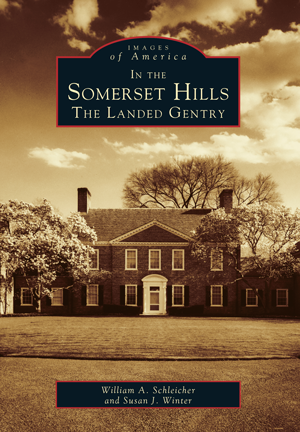 This fascinating new book introduces us to the landed gentry of the Somerset Hills, with over 200 images bringing to life these colorful families and their magnificent estates. We meet the great families themselves, from the Seneys, Drydens, Stevenses, Pfizers, and Roeblings, to the Forbes, as well as such famous individuals as Jackie Kennedy and King Hassan II of Morocco. We are shown around the great estates, and see the stone masons, wood carvers, and other artisans and tradesmen who created them. Authors William Schleicher and Susan Winter explore the remarkable history of this elite cultural enclave, bringing to life its history and illuminating its future. Readers will be delighted by its thorough and vivid presentation of this unique New Jersey community.